Eric Carle couldn't ask for a more suitable showcase than Singer's short and obvious fable about how an elephant, a lion, a fox and 31 other animals vie to be taken onto the ark -- each one claiming priority on grounds of being strongest, largest, cleverest, or whatever. 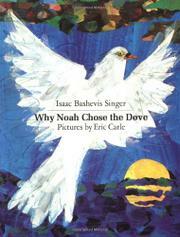 At last the dove, when his turn comes round, reminds them all anticlimactically that "each one of us has something the other does not have" and Noah agrees that there is no need to boast and compete, for God has ordered him to take creatures of all kinds. Actually the pictures only strengthen our suspicion that Carle can't illustrate a story; instead he merely displays his one-note repertoire of flat, collagey animal portraits. Of course the sheer scale and number of animals on parade could make this a nursery success.